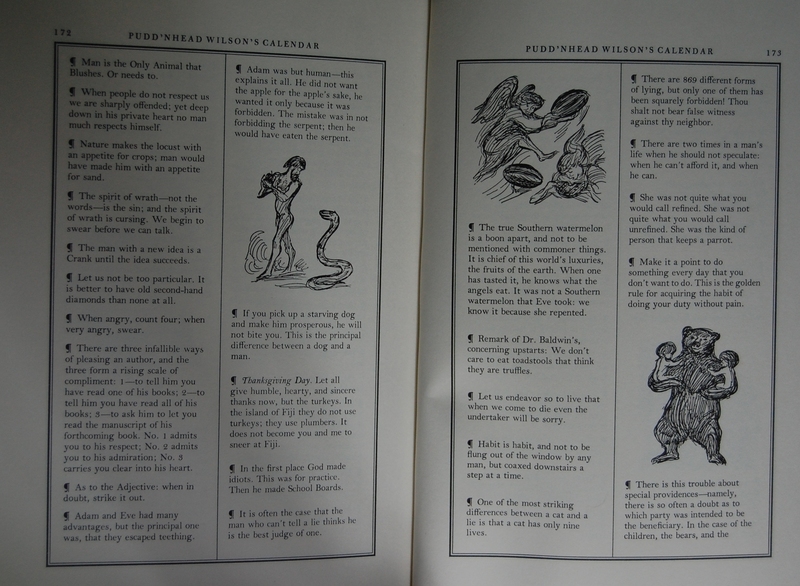 Introduced by Edward Wagenknecht; includes Pudd’nhead Wilson’s Calendar, complete for the first time! Front Binding – Mr. Clemens makes his third appearance on the blog today, with his relatively late offering of Pudd’nhead Wilson, issued in 1974 by Cardevon Press in Limited Editions Club and Heritage Press editions, the latter of which I present you with now. 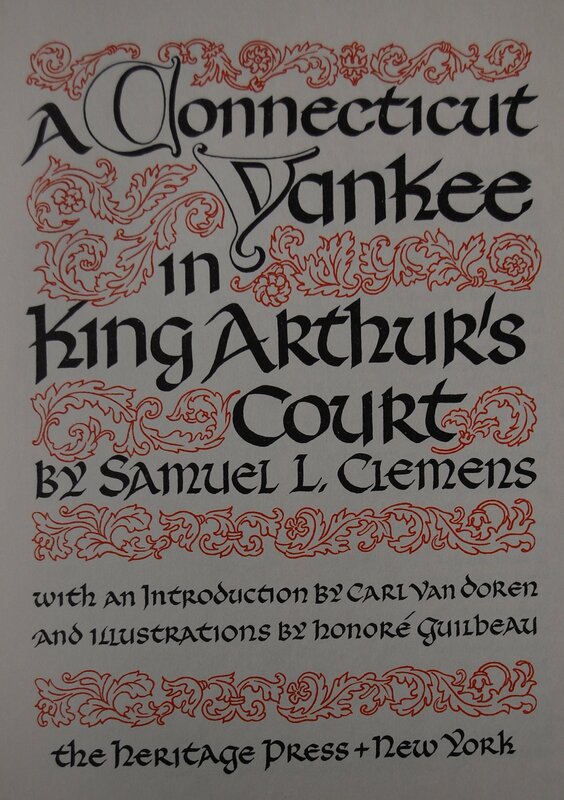 Mark Twain’s first title spotlighted by the blog was A Connecticut Yankee in King Arthur’s Court; The Adventures of Tom Sawyer was the second. 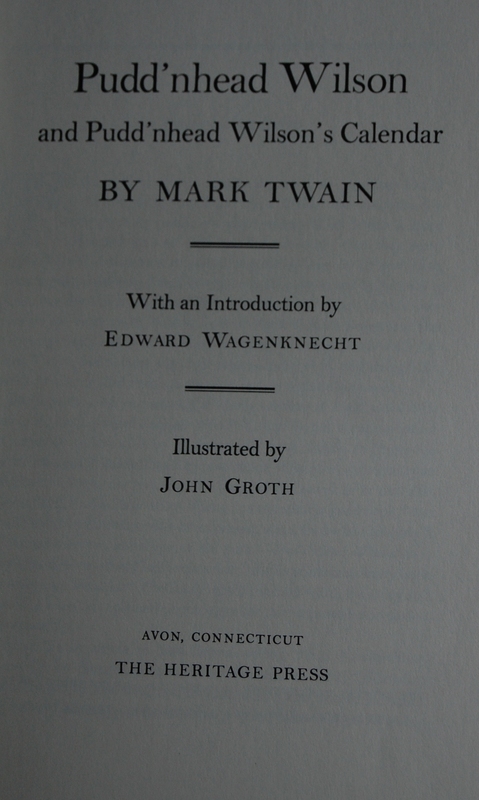 Yankee features an extensive listing of Twain’s publications, of which this was the very last one issued by the LEC. As it so happened, it also was the last commission of John Groth for the LEC, who had rendered three prior books: The Stories of O. Henry in 1965, Gone with the Wind in 1968, and All Quiet on the Western Front in 1969. Four notable books there! Groth was a journalist as well as an artist, and I’ve seen a book of his reporting on the Vietnam or Korean War full of his drawings and commentary on the topic. 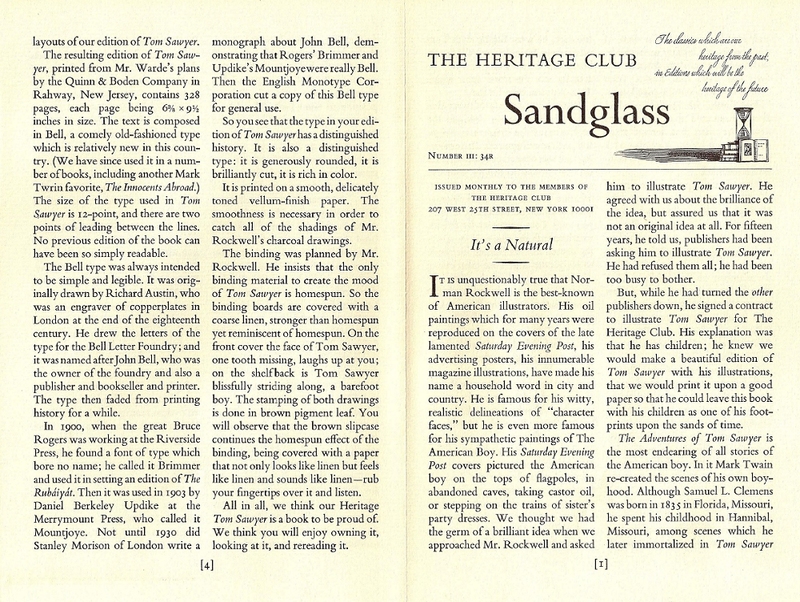 The Limited Editions Club included a plethora of supplementary material for both editions: an author’s preface, “A Whisper to the Reader”, a note from Twain regarding the evolution of the book from its origins as “Those Extraordinary Twins”, and the Calendar printed in the back (The LEC issued this part separately as its own paperbound volume). 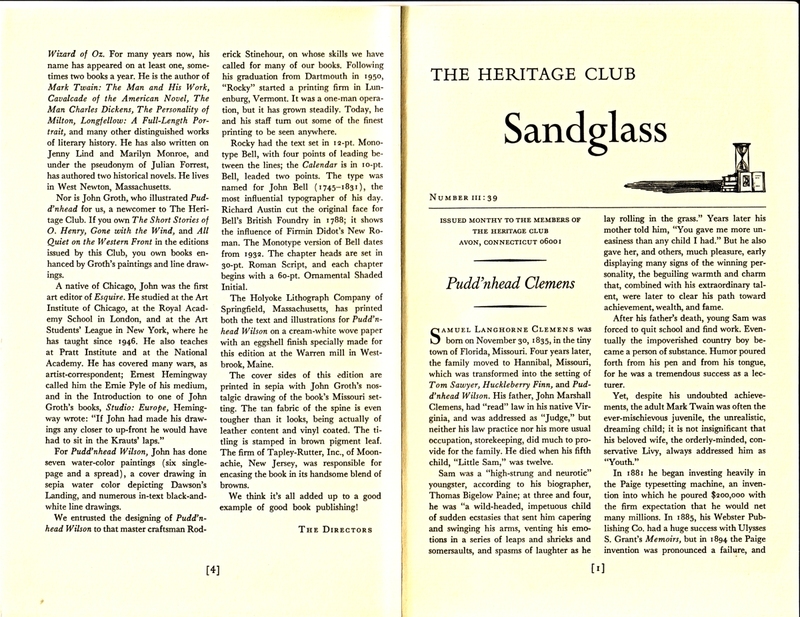 The Sandglass claims that this is a first; it includes all of the little tidbits that opened every chapter of Wilson, as well as from a different work that ran with the same idea, Following the Equator. Roderick Stinehour is the designer for this edition, using 12-point Monotype Bell as the primary font. The Calendar is in 10-point Bell. Chapter heads are in Roman Script, and the Initial Initial is in Ornamental Shaded Initial. 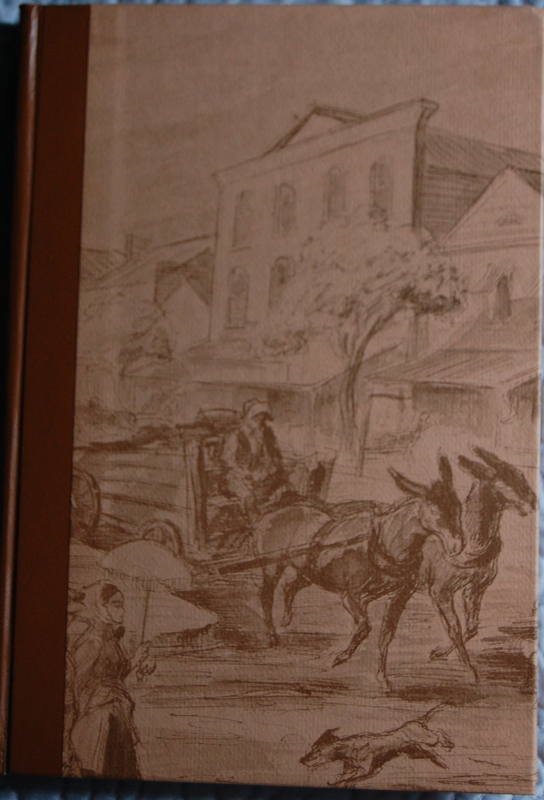 Holyoke Lithograph Company handled the printing on Warren Mill paper. 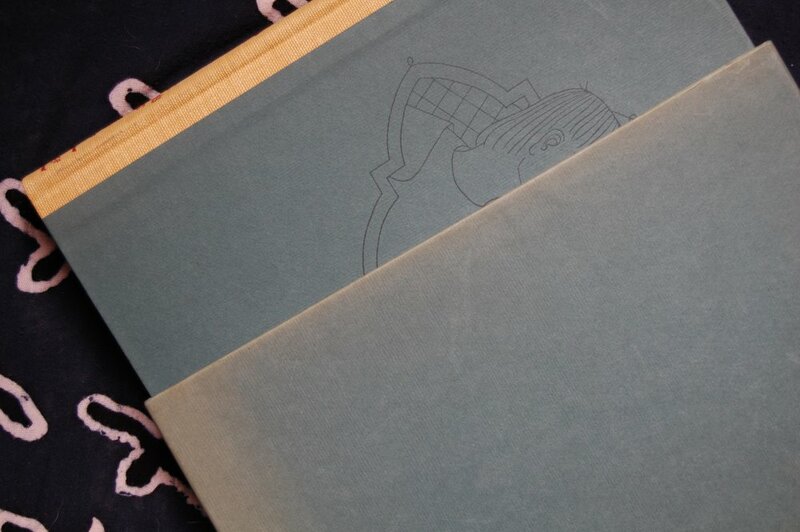 Groth’s special cover illustration graces the boards, the spine of which is “leather content and vinyl coated”. Tapley-Rutter bound the book (I presume this is an evolution of Russell-Rutter?). Title Page – Edward Wagenknecht is no stranger to the LEC and their Twain offerings; this is the seventh introduction penned by him! 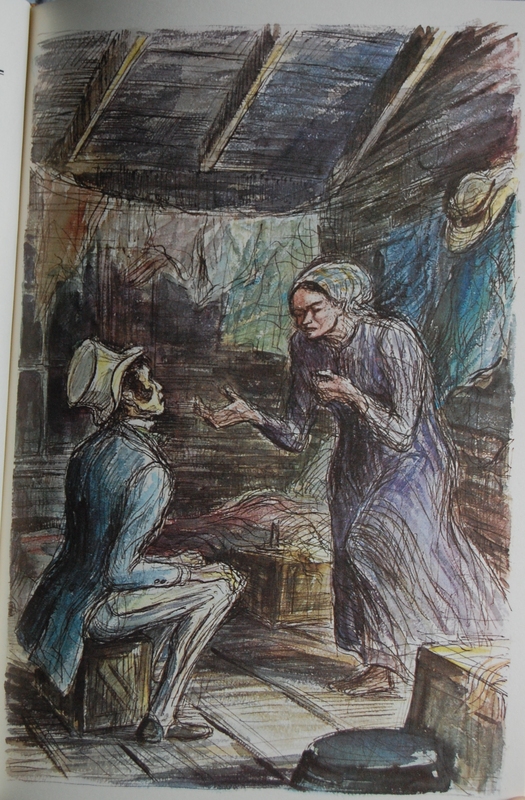 Page 14 – Groth utilizies both pen drawings and watercolored paintngs for this book; clearly, this is an example of the latter. 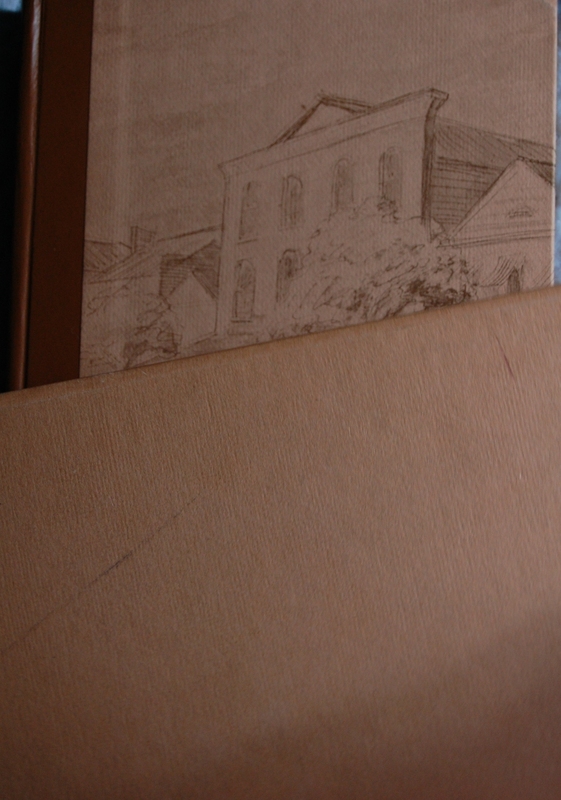 Page 33 – The drawings are very nice; I think prefer them to Groth’s paintings. Page 172-173: An example of the included Pudd’nhead Calendar, which I believe was issued separately for the LEC edition. Personal Notes – Memory leaves me on how exactly I came across this book at the moment. I think it came from Second Time Around as a volunteering bonus, but I’m not 100% certain on that. Such is life sometimes; it can leave behind the faintest of fragments of memory. :p I have this more for the work than for the art; Groth’s paintings don’t quite resonate with me, but I do like his linework. 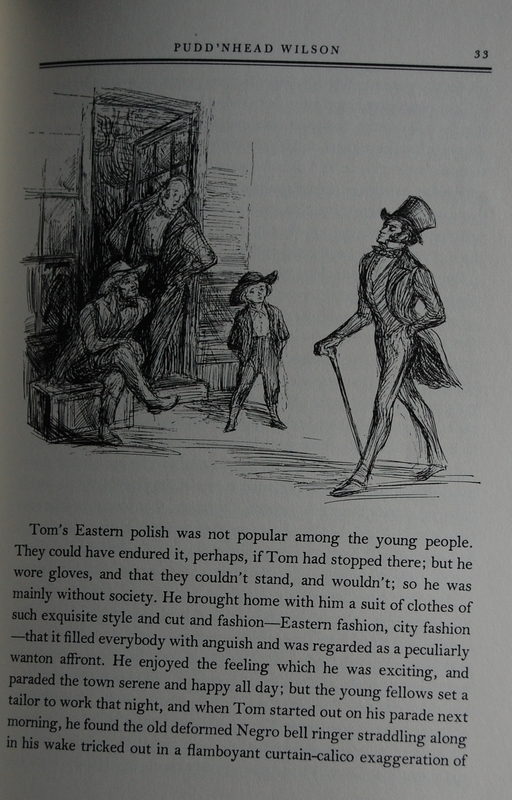 Heritage Press Exclusive – the LEC would print their own Tom Sawyer with Thomas Hart Benton’s illustrations in 1939. 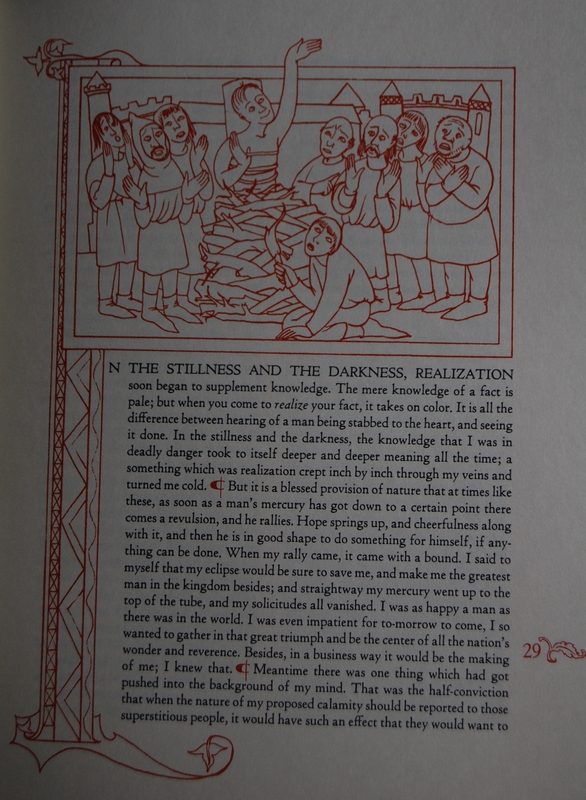 The Connecticut reprint is usually on top here, followed by the New York Illustrated Bookshelf edition below. I’ll explain the Illustrated Bookshelf distinction below! 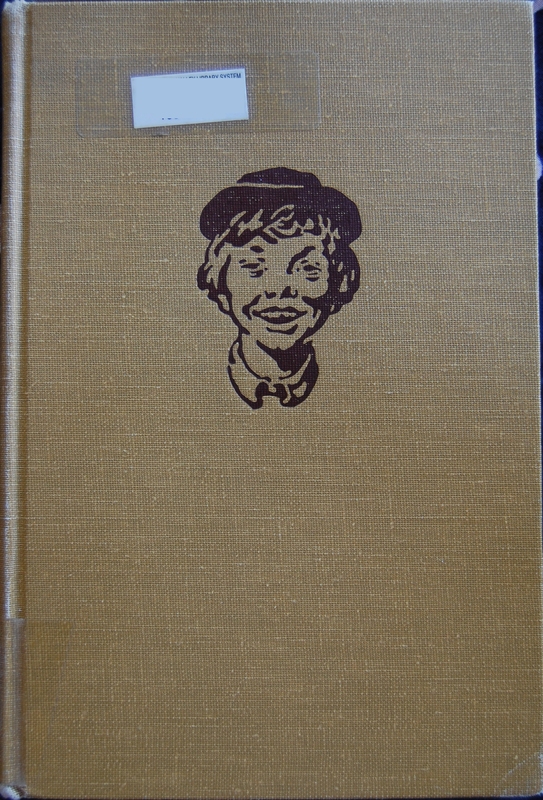 Front Binding – Well, the first thing that should leap out at you is the fact I’ve got a Huck Finn binding as the New York representative…but I assure you that Tom Sawyer is the book inside. A curious binding error I imagine didn’t happen too often. Anyway, the Connecticut printing keeps Tom’s head front and center but drops the text, going with a beige/brown combo. 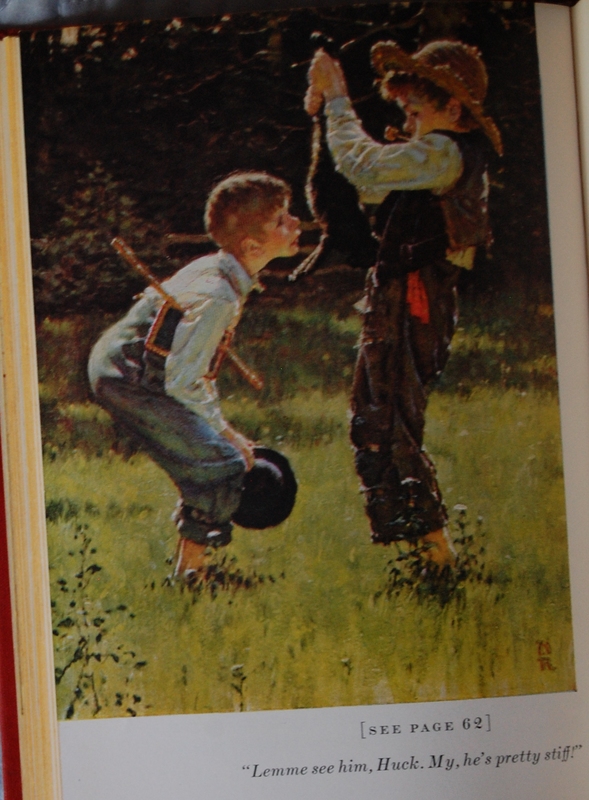 I can’t vouch for the actual Tom Sawyer binding for the Illustrated Bookshelf run, alas, due to the error, but I imagine it was close to this but with Tom Sawyer items where Huck’s are. The original Heritage was designed by Frederic Warde, no stranger to the George Macy Company. The Sandglass mentions that he had done “several” Heritage books, which indicates that this is not the first printing’s letter. 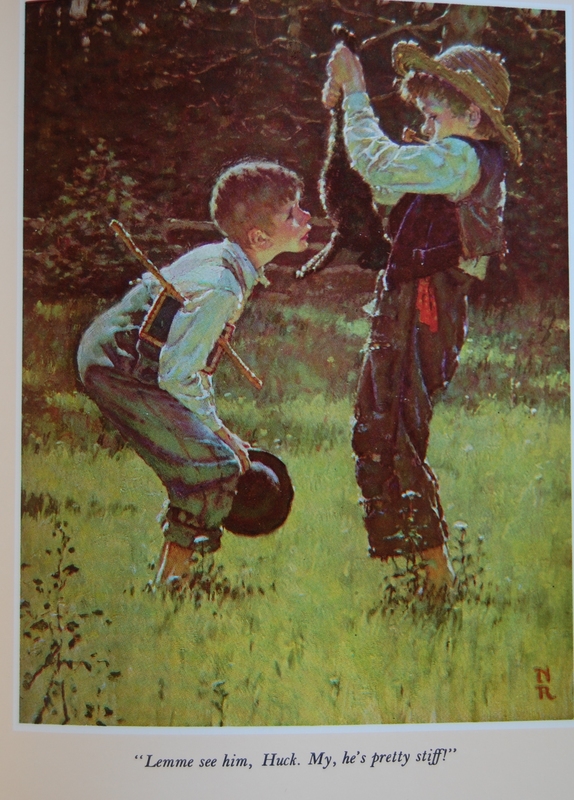 The binding itself was designed by Norman Rockwell. 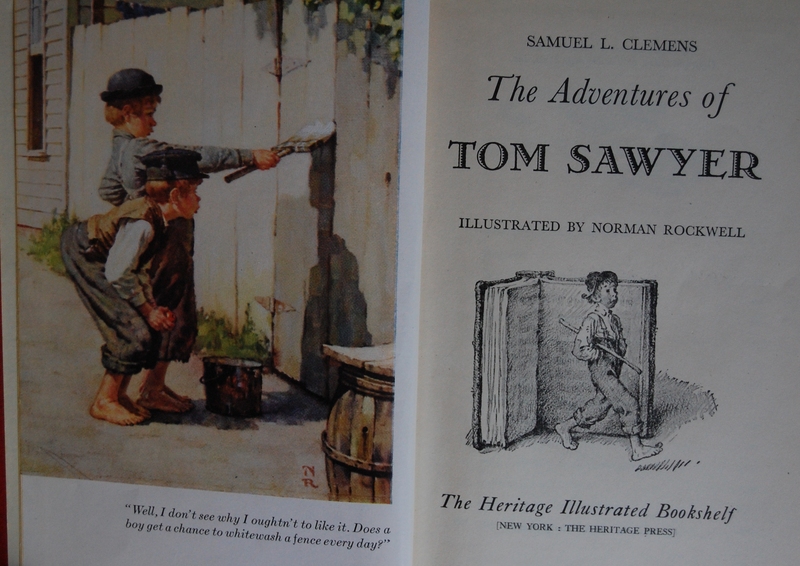 Tom Sawyer was printed up by the Limited Editions Club in 1939 with the artistic talents of Thomas Hart Benton, which was his first commission for the Club. Twain’s The Adventures of Huckleberry Finn (a second printing – I’ll explain below) and Life on the Mississippi would follow, as well as the acclaimed printing of John Steinbeck’s The Grapes of Wrath and his final work, Lynn Riggs’ Green Grow the Lilacs. The latter three would see reprint as Heritage Press editions (good luck finding The Grapes of Wrath – it’s almost as rare as the LEC! 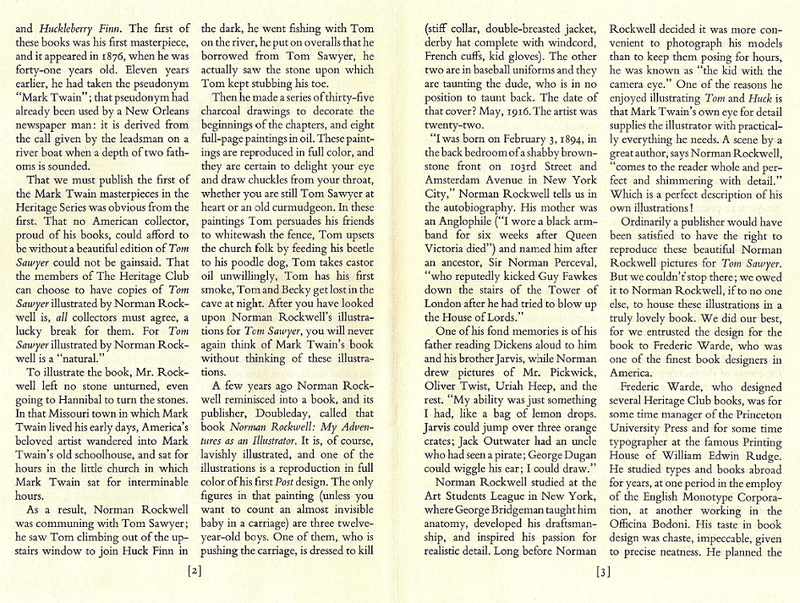 ), but for Tom and Huck the Heritage Press had gone with their own unique printings featuring renowned American painter Norman Rockwell as the illustrator. Tom was printed in 1936, but I’ll have to check on Huck. Rockwell also did Poor Richard’s Almanac for both clubs later on. The Sandglass goes on and on about Rockwell, which I’ll let it do. As for Mr. Clemens himself, the George Macy Company loved him, and Cardevon Press continued that love. Twain was printed twelve times by the LEC alone – a remarkable number that few other authors could match (Shakespeare is the only one who leaps to mind at present, with a staggering forty-one LEC editions, although thirty-seven of those were a special run of his complete works). We currently have this and the Heritage A Connecticut Yankee in King Arthur’s Court up, but that wasn’t where it began. 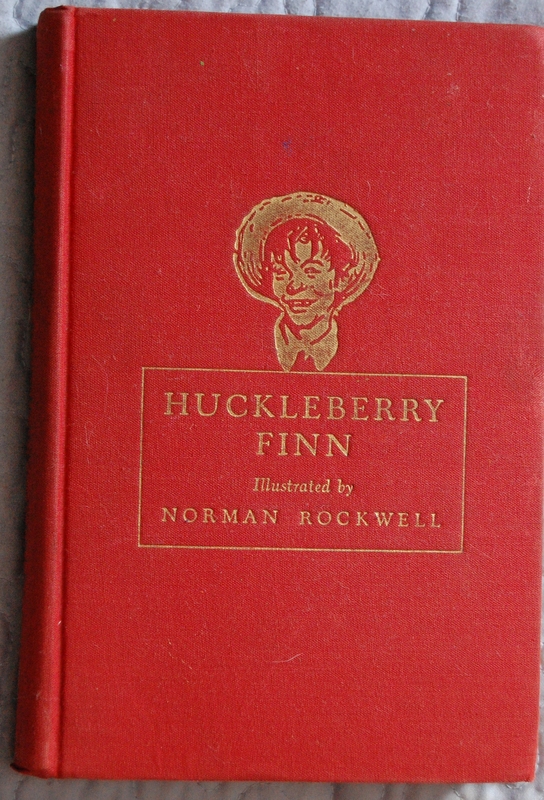 Twain’s legacy with the George Macy Company kicked off with Huck Finn in 1933, but neither Benton or Rockwell are attached to that project. Carl Purington Rollins provides a signature (as its designer), but E.W. Kemble served up illustrations for it. Booth Tarkington wrote an introduction, as well – another case of a future LEC author getting an intro in an earlier work (like Thornton Wilder). This one was printed at Yale University. 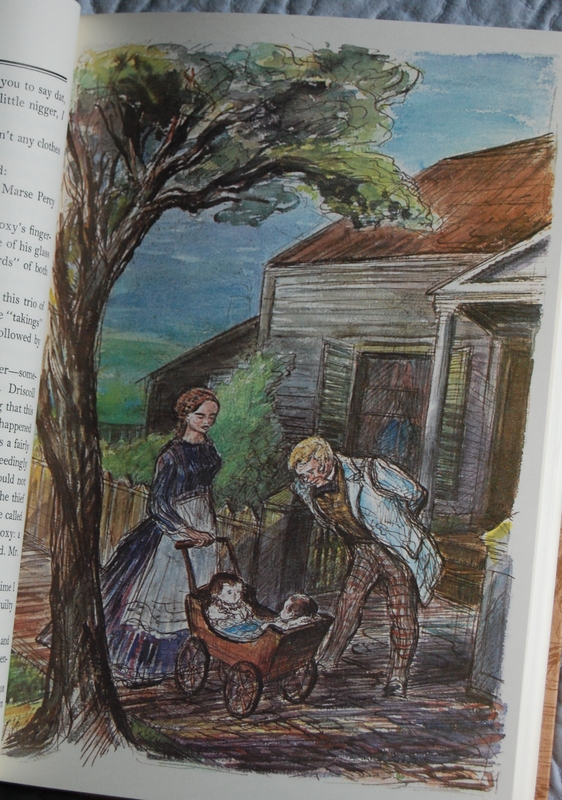 Anyway, Benton’s Huck arrived in 1942, likely after his Tom Sawyer was so received. Bernard DeVoto supplied that edition’s intro. But enough with Huck – this is about Tom! The Rockwell Heritage here preceded Benton’s LEC by three years, and, if I can, I’ll provide further comparisons down the road. My last note – Benton’s never saw release as a Heritage. As both of my Toms lacked any informational letter, I’d like to know who designed the original Heritage printing, so if you know, please drop me a line! Thanks to kdweber at Librarything, I can pass along the book’s printing details! Warde selected the Bell font (which was also used in The Innocents Abroad, which was done in 1962 – obviously this is not a first printing!) in 12-point, which the history of which is in the Sandglass. It was printed by the Quinn and Boden Company in New Jersey (at the very least this one was). The binding process is notably absent, though. Now, with all that out of the way, we can focus in on the book’s paintings. Conn. Preface – Why this was moved to the preface instead of the title page is beyond me. I will say that the colors and sharpness are a bit dulled for the Connecticut reprint, which isn’t a surprise. However, compared to South Wind, it’s at least recognizable. 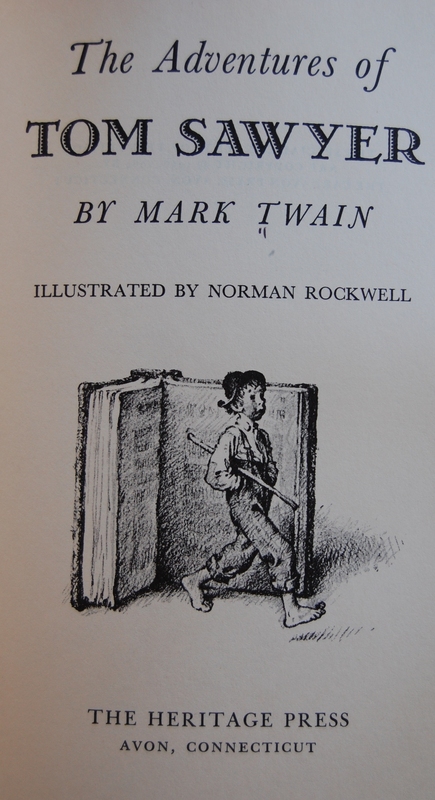 Personal Notes – I think Rockwell is a good fit for Twain’s ragamuffins, so I wouldn’t mind owning a nicer edition of it than I had (which got wet :( ). * = I suspect Cardevon did not alter a pub date from the George Macy Company for their printing, as they did not take over until 1970, and Helen Macy was still in charge in 1964. 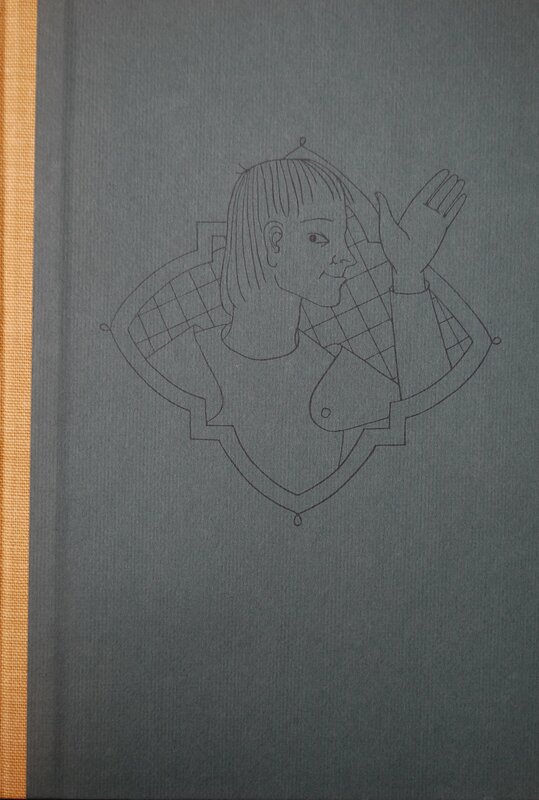 Front Binding – A pleasant enough looking book, with a smiling lad in armor waving at you! The linework of Honore Guilbeau, last seen inside of The Shaving of Shagpat, is strikingly different in style from the later book. 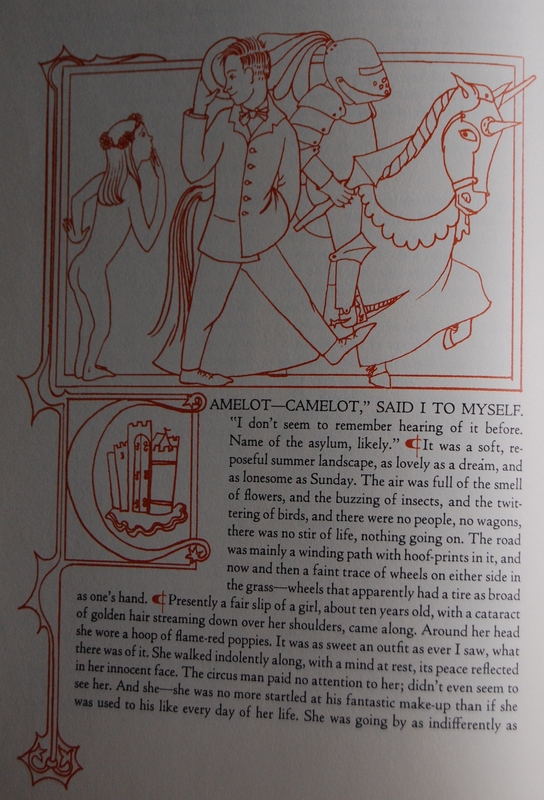 Personally, I’m inclined to believe that this may be her finest art inside of a Macy tome. The aforementioned Shagpat chronicles her George Macy Company career. Back to the boards: blue cloth boards and a yellow cloth spine, with red text for the spine. Wish I could say I was done, but no, there’s a bit more in terms of Heritage exclusives to cover! 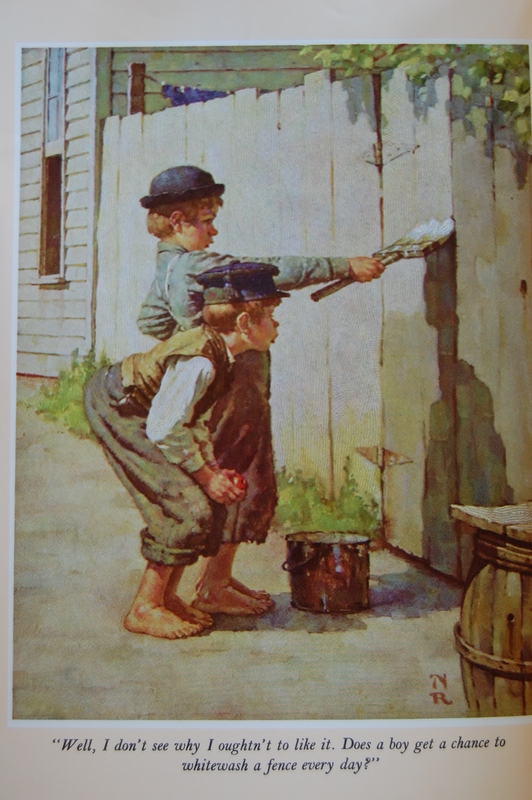 Norman Rockwell was recruited to do editions of Huck Finn and Tom Sawyer. Lastly, Warren Chappel was called in to do his own version of this particular book. Huh, I’ll need to find that one. I now have the Sandglass for this, so I’ll get around to scanning it in the near future. Title Page – Guilbeau’s design chops are highlighted in this book, as her leafy embellishments add a lot to this eye-catching title page. I LOVE the font used here. 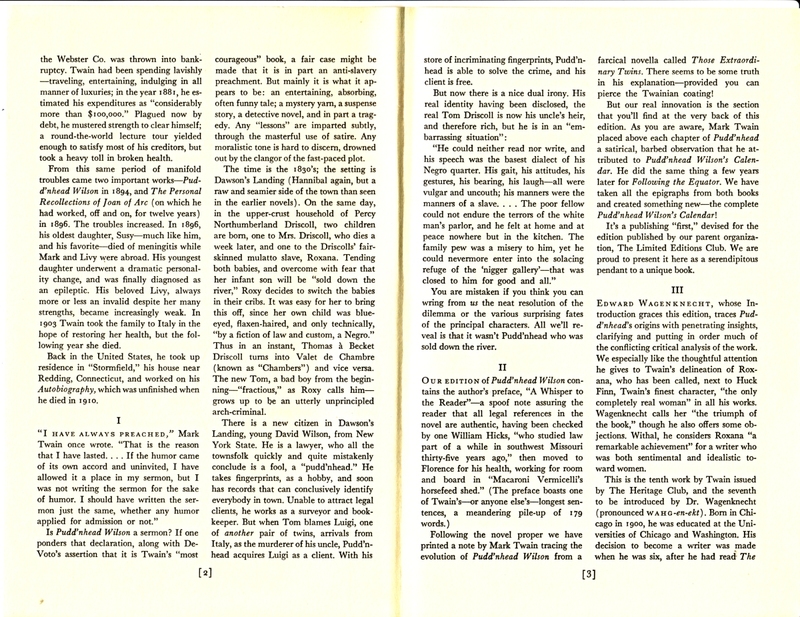 Carl Van Doren provides some introductory comments to Twain’s fantasy/humor novel. Page 8 – Man, I love the layouts of the chapter beginnings. The red lines are a delightful contrast to the black text, and I think this may be one of my favorite interiors in any book. Personal Notes – When I first wrote up this post, I used a library copy. Now I do own it, and I’m pleased as punch. I really like this book. You are currently browsing entries tagged with mark twain at The George Macy Imagery.